The University of Gloucestershire Religion, Philosophy, and Ethics website has several good short videos about the Philosophy of Sport with Dr. Emily Ryall. Dr. Ryall is a Senior Lecturer in Philosophy at University of Gloucestershire. Should we regard Elite Athletes as Heroes? Is Sport a form of Art? A video interview with Dr Emily Ryall. Sport as form of moral education. Can Sport make us Good? 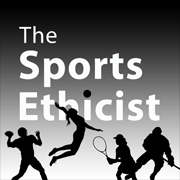 I don’t agree with every take, of course, but the videos are nice introductions to some interesting questions and important issues in Philosophy of Sport.